Mars Mystery: Has Curiosity Rover Made Big Discovery? NASA's Mars rover Curiosity used its Mars Hand Lens Imager (MAHLI) to snap a set of 55 high-resolution images on Oct. 31, 2012. Researchers stitched the pictures together to create this full-color self-portrait. This story was updated at 2:25 p.m. Eastern time. NASA's Mars rover Curiosity has apparently made a discovery "for the history books," but we'll have to wait a few weeks to learn what the new Red Planet find may be, media reports suggest. The discovery was made by Curiosity's Sample Analysis at Mars instrument, NPR reported today (Nov. 20). SAM is the rover's onboard chemistry lab, and it's capable of identifying organic compounds — the carbon-containing building blocks of life as we know it. SAM apparently spotted something interesting in a soil sample Curiosity's huge robotic arm delivered to the instrument recently. "This data is gonna be one for the history books," Curiosity chief scientist John Grotzinger, of Caltech in Pasadena, told NPR. "It's looking really good." The rover team won't be ready to announce just what SAM found for several weeks, NPR reported, as scientists want to check and double-check the results. Indeed, Grotzinger confirmed to SPACE.com that the news will come out at the fall meeting of the American Geophysical Union, which takes place Dec. 3-7 in San Francisco. The $2.5 billion Curiosity rover landed inside Mars' huge Gale Crater on Aug. 5, kicking off a two-year mission to determine if Mars has ever been capable of supporting microbial life. The car-size robot carries 10 different instruments to aid in its quest, but SAM is the rover's heart, taking up more than half of its science payload by weight. In addition to analyzing soil samples, SAM also takes the measure of Red Planet air. 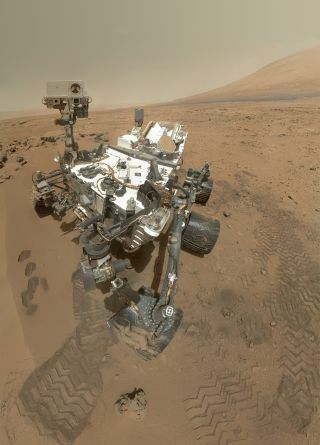 Many scientists are keen to see if Curiosity detects any methane, which is produced by many lifeforms here on Earth. A SAM analysis of Curiosity's first few sniffs found no definitive trace of the gas in the Martian atmosphere, but the rover will keep looking. Curiosity began driving again Friday (Nov. 16) after spending six weeks testing its soil-scooping gear at a site called "Rocknest." The rover will soon try out its rock-boring drill for the first time on the Red Planet, scientists have said.